You will be given a reference e-book to read which has 243 pages And the test will be based on that e-book , you can take final test within 1 year of purchase. Personal development encompasses activities that work in improving identity and awareness, developing potential and talents, facilitating employability, building human capital, contributing realization of aspirations and dreams and enhancing life quality. The good thing about personal development is that it is not only limited to providing self-help because it also works in providing informal and formal activities that are extremely useful in effectively developing the personality of others so they can easily fill the roles of guide, manager, mentor, life coach, counselor and teacher. It also refers to all the programs, methods, assessment systems, techniques and tools that are capable of supporting human development at individual levels in various organizations. Personal development actually encompasses activities such as improving self-knowledge and self-awareness, renewing or building identity, improving wealth, developing spirituality, building human capital or employability, improving or identifying potential, improving health, enhancing social abilities, fulfilling dreams and aspirations, enhancing life quality or lifestyle and executing plans for personal development. Personal development is also defined by experts as the practice and study of improving the lives of individuals including their career, health, relationships, educations, spirituality, productivity, happiness and any other personal objectives. Among its most common aspects are goal setting, changing habits, self-actualization and motivation. It should also be noted that as an industry, personal development comes with numerous business relationship and operating formats. These include the business to business, the business to consumer, the consumer to consumer and the consumer to business formats. 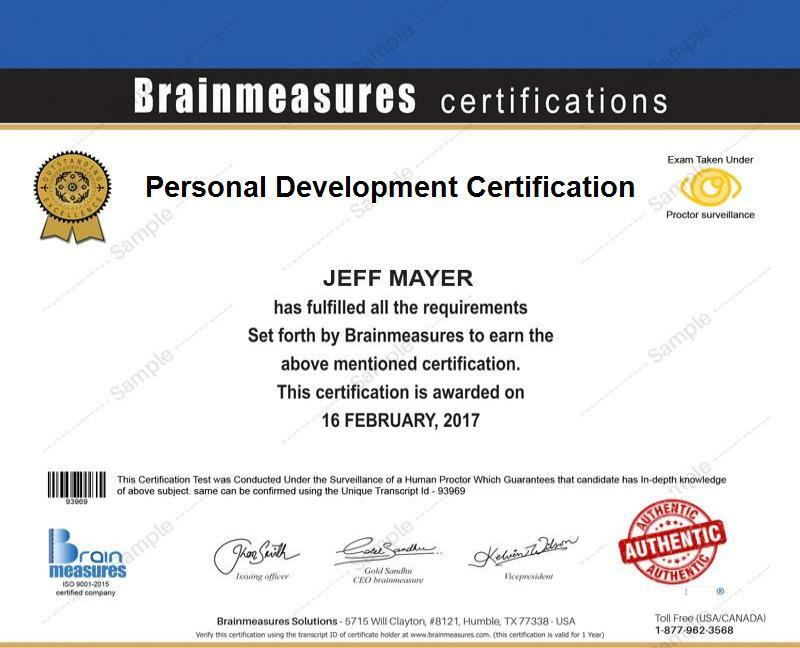 If you have longed to become a real expert in the field of personal development, then an online certification company in the name of Brainmeasures can definitely help you out because it now offers a personal development certification course. The personal development course which is now accessible at Brainmeasures is guaranteed to help you master all the aspects associated to this popular practice or study. It allows you to undergo a personal development training which is guaranteed to hone your skills and strengthen your background in personal development because it offers all the information that you need to become a real expert in this field including the major objectives of personal development, the most common aspects that are linked to it, the coverage of the study, the personal development activities that are usually performed and the major business relationship and operating formats that it uses. By earning your personal development certificate, you will no longer have an extremely difficult time proving your proficiency and skills in this field to the public. You will never regret enrolling in the personal development certification program offered by Brainmeasures because of its comprehensiveness and the high level of accuracy of all the information that it provides. It offers more benefits to all individuals and professionals who aim to develop their self-awareness regarding their own preferences and personality style as well as making them understand their key strengths and weaknesses, the specific styles that they use in communication, probable blind spots and their real value to a team. You will also enjoy holding a personal development certification because of its effectiveness to help you hold great positions within a business organization while also earning a more stable pay. You can use your personal development certification to grab the position of a personal development coach which allows you to receive around $46,000 to $85,000 annually. Working as a personal development consultant is also beneficial because this profession offers around $68,000 to $121,000 per year.